Oxford University has opened its doors to the BBC to allow them to film the animals in its facility. This is a giant step for a university which has a long history of being a target for animal rights extremism. Oxford University was the subject of a 4-year sustained campaign (activists do still turn even now, 10 years on). The BBC’s Fergus Walsh filmed mice, ferrets and macaques, including some behavioural experiments on the monkeys. On the same day the Guardian newspaper reported in more detail on one of the Oxford studies mentioned in the BBC report, which used two different MRI scanning techniques – fMRI and diffusion-weighted MRI – to examine in both humans and macaques the functional relationship between different areas within a brain region known as the human ventrolateral frontal cortex (vlFC) and other regions of the brain, and identified key differences in regions of the vIFC involved in hearing and language processing, and in evaluating decisions after they have been made. This research. which is published in the journal Neuron, was described as “stunning work” by leading neuroscientist Karl Zilles, and will help improve the understanding of psychological disorders and the development of new therapies. It is also a good example of why claims by animal rights activists that fMRI can replace animal research are simply wrong, but then, you already knew that! Such outreach plays an important part in helping the general public understand conditions in animal research labs especially when groups like PETA like to put out misleading images of animal labs. 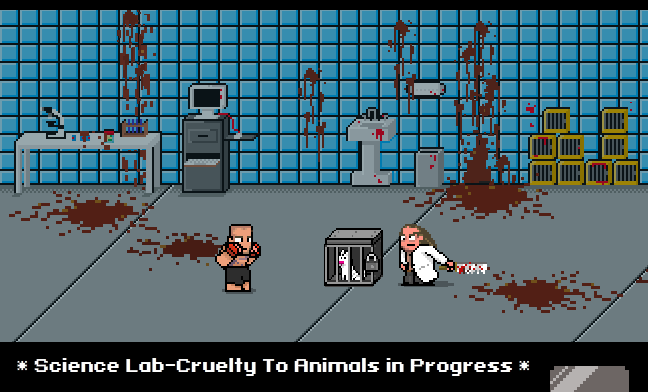 PETA’s MMA game depiction of animal research. In September 2012 we congratulated the University of Leicester for opening the doors of its new Central Research Facility.The result was hugely positive, and it helped quickly put to rest baseless allegations by a local animal rights group (which has since disappeared through lack of local support). Recently the Medical Research Council produced video clips of its breeding facility in Harwell. Still institutions could do more. Many US primate research center’s have systems to allow regular tours by the public – helping them both understand the role of animals in research, and to give them a real impression of what it looks like. It would be a positive step for more UK institutions to provide tours to local residents and journalists. On the back of the Oxford University story, Tom Holder, Speaking of Research Founder, participated in a brief debate with Michelle Thew of the BUAV on BBC Radio 5 live which can be heard here (from 38 minutes). Posted on January 29, 2014 January 29, 2014 by EditorPosted in News, Outreach NewsTagged animal testing oxford, biomedical research facility, oxford lab, oxford university, Oxford University biomedical research.